We spend 8-10 hours a day, 40-60 hours a week, year in and year out at our job, yet many workplaces are No Places. Cubicles, white walls, bland artwork, square buildings -- these workplaces could be anywhere, producing anything. I spend a great deal of time visiting clients in No Places -- our Government clients work in boxy, faceless offices where every office, every long hallway, every building looks exactly alike. Typically I have a good sense of direction, but I often get lost going to a client site that I've been to several times. There just aren't any distinguishing landmarks. I've even seen my clients get "lost" in their own building when they come to pick me up at some remote secured entrance. 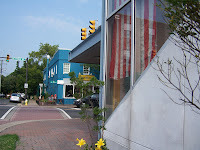 My partner, Aldo, and I have worked hard to ensure that our own offices at Mind & Media, in the funky little neighborhood of Del Ray, capture the sense of Place that builds connectedness and promotes creativity. Our walls are colorful and full of art that employees have created. There are plants and natural light and awards we've won. Cubicles have been abolished for personalized work spaces and community areas. Our clients love to come here. Many have expressed on more than one occasion that they "feel at Home." They like coming over to see our dogs, which we often bring to work, to see our collection of old communication equipment, and to walk to one of the many restaurants in our neighborhood for lunch. They come at first in suit and tie, but on the next visit they come in casual attire and with a smile on their face. Indeed...I felt very strongly that in order to have a company that felt like our "own," it needed to have a definite identity. Just as WE are individuals, with our own distinguishing characteristics, places of work should also have their own feel, their own way of being. It sems to me that most business owners don't really want to deviate too much from the norm because there is a strong demand to fit in, to look like everyone else and not to rock the boat too much because the norm equates with stability, dependability, which also translates into trust. But in striving for so much conformity, we eliminate precious other assets. The aspects that make us unique, the creative impulse and our natural yearning for beauty expressed via our surroundings ... all of which are extremely important in the creation of work spaces that are real and exude a sense of place. I guess Marilyn and I are fortunate because we happen to own a company that deals in the creation of highly crafted media and is a company that welcomes and embraces creativity...but now that I think about it, what business couldn't use some more of that? I have had the pleasure to work with Mind and Media for the last 9 months. One of the first things that attracted me to the firm was that they had crafted a community comprised of charismatic, open, highly creative and passionate individuals. Together, they have developed a special recipe that is a wonderful blend of all of these attributes and added some playfulness/fun mixed with a heavy dose of results. I have introduced Mind and Media to many other firms/individuals. Every person has come away with a similar "WOW" to the one that I experienced. Mind and Media occupies a space(s) that is/are unique because of the attention they pay to detail: The People, the Process, the Inspiration, and the Space. When you have the opportunity to go to a place called Mind and Media, you will leave with a unique "customer experience". Mind and Media has continued to pay attention to the details of the customer experience and makes changes/improvements to this continuously. This means that your next experience will be different than the last and as a result you will gain more value from haven taken the time to go to Mind and Media. I enjoy each and every trip that I make.